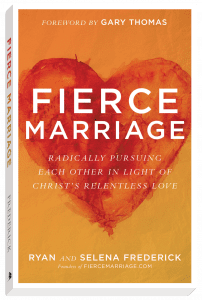 This is an adapted excerpt from Fierce Marriage: Radically Pursuing Each Other in Light of Christ’s Relentless Love (Baker Books, 2018), and is published in partnership with Baker Books. It’s easy to idealize marriage. This is especially true for younger generations who have grown up seeing reality through the lens of social media. Authenticity is applauded, and sharing your real life is celebrated—just as long as it’s not too authentic or too real. Next, the gospel shows us exactly what covenant means—and what we can expect to accomplish when we submit ourselves to mutual love within covenantal boundaries. Your marriage can be incredible when both of you base your choice to love not on the other’s performance, but on the promises you have made. Selena and I have said it many times: if it weren’t for Jesus, we would have gotten divorced years ago. At times giving up would have been so easy—or so we felt. Even more than strength to endure difficulty, the gospel affords us unmatched joy while doing so. Why? Because our hope is eternal, and the story we’re part of is not about us. It’s about Jesus. Every aspect of your marriage is designed by God for his eternal glory and your ultimate joy. Through the gospel, your marriage has infinite power and purpose, because it points to an infinite and powerful God. That is why we’ll continue to sound the trumpet of the gospel for marriage. Only in the gospel do you have purpose beyond now, beyond you, and beyond measure. In Christ, you have access to the infinite goodness of the eternal God, both in this life and also the next. Everything about marriage points to the gospel. By God’s grace, your marriage can do the same. Ryan Frederick is passionate about helping men treasure Christ most and love their families well. He and his wife, Selena, founded their blog, Fierce Marriage, with one simple mission: to point couples to Christ. Together, their writing reaches millions of monthly readers around the world with the transformational message of the gospel. Selena Frederick is passionate about helping women treasure Christ most and love their families well. She and her husband, Ryan, founded their blog, Fierce Marriage, with one simple mission: to point couples to Christ. Together, their writing reaches millions of monthly readers around the world with the transformational message of the gospel.